Talk about strange! 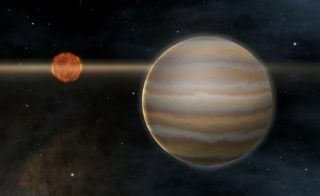 An artist's rendering of the 2M1207 system, which includes a dimly lit, failed star known as a brown dwarf (right) and a young, warm, planetary mass object in orbit. Its just one of the many new types of setups that defy classification. BALTIMORE - Astronomers met last week to celebrate the tenth anniversary of the first planet discovered around a normal star other than the Sun. Although more than 130 other such planets have been found since then, the field still feels like it is just getting started. And the places they see are getting stranger every year. Many recent breakthroughs have occurred in planet detection. The frontiers being crossed are towards planets with wider orbits and less mass. Along the way, though, strange objects may require retuning theories, and maybe even definitions. "We are in fantastic times," said Michel Mayor of the Observatoire de Geneve. "In ten years, we have a lot of new data." Mayor was one of the astronomers who detected the first extrasolar planet - that is, outside our solar system - in 1995 around the star 51 Pegasi. To commemorate this and other discoveries the Space Telescope Science Institute (STScI) organized its May 2005 Symposium, "A Decade of Extrasolar Planets Around Normal Stars." Planets had been found earlier, in 1993, around a pulsar, which is a magnetically active neutron star. Although pulsars do not create very habitable surroundings, not many of the other planets found since are likely to support life either - which some may find disappointing. "At the end of the day, all these fine people - who are looking for planets and how they form -really are interested in this question: 'Is there intelligent life elsewhere?'" said the symposium organizer Mario Livio of STScI. Planet-hunters hope to give part of the answer by determining whether our solar system is common or unique. A lot of the new data paints a picture in which more planets are more likely to be found. Some day, almost certainly, astronomers will celebrate the tenth anniversary of the first Earth-like planet detected around a Sun-like star, many astronomers say. As of now, about six percent of normal stars surveyed have been found harboring a gas giant planet, like Jupiter or Saturn. Most of these planets are very close to their star - some with orbital periods, or "years," as short as a few days. Such tight orbits creating scorching conditions. This preponderance of big, close-in planets - so-called hot Jupiters - has developed because the early years of planet-hunting have been dominated by the radial velocity method, which relies on detecting a wobble in the host star due to the gravitational tug from the orbiting planet. The tug is bigger when the planet is closer and larger, and so hot Jupiters are easiest to find. Even when a wobble induced by a more distant planet is noticeable, researchers wait until they see a complete orbit. This imposes a limitation - or "curtain" as Alan Boss of the Carnegie Institution of Washington puts it - on detecting planets with longer periods that correspond to larger orbits. One way to think of this is that it would take at least a year of observations to confirm a planet at one astronomical unit (AU), which is the Earth's distance from the Sun. It would take about 12 years to confirm one at Jupiter's orbit of five AU. Some radial velocity searches are more than a decade old now - pushing back the curtain to larger planet-star separations, where theories predict more gas giants should be found. Already, Geoff Marcy of the University of California, Berkeley, is finding a rise in the number of planets out beyond 1 AU. Marcy predicts that the frequency of gas giants on long orbits is as high as those closer in. If correct, then about 12 percent of normal stars have at least one Jupiter or Saturn. "But the inverse is maybe more interesting - about 85 percent of stars do not have a gas giant," Marcy said. This may mean Jupiter-sized planets are somewhat hard to form. This may or may not be true for terrestrial planets, like Earth. The most-favored theory of planet formation assumes that rocky cores form readily in the disks of leftover material around newborn stars, but only some of these planet seeds are big enough to capture gas to become a giant. "If you can somehow deplete these disks of their gas relatively fast, that would be one way that you would not get a giant planet," Livio said. As an example, Livio gave a star-forming region, where the radiation is so high that it may blow out most of the gas around the young stars. The cores, however, would presumably survive to form smaller planets like Earth. "I imagine most stars have terrestrial planets," Marcy said. "It seems hard not to form them." To test whether Earths are common is going to take time. Detection sensitivities in the radial velocity technique have improved to the point that a few Neptune-sized planets - around 20 times the mass of the Earth - have now been spotted. But it will be hard to see planets of much lower mass with radial velocities. They simply do not tug on their stars hard enough. Fortunately, another planet detection scheme, which relies on a planet blocking or brightening the light from a star, may take up the slack. If a planet crosses, or transits, in front of its own star, the starlight dips in brightness. Many programs are currently watching large populations of stars, waiting for such an eclipse to happen. To date, seven planets - all large and close-in - have been found by this transiting method. Careful follow-up observations of transits have detected planetary atmospheres and - just last month - the Spitzer Space Telescope observed the heat-radiation from two transiting planets, which implied they were around 1,500 degrees Fahrenheit. Stars can magnify other stars in our galaxy when one passes in front of the other, owing to the fact that the gravity of an object bends light coming from a more distant object. If the lensing star has a planet around it, the magnification can be greater. One advantage of microlensing is that it is more sensitive to large planet-star separations. David Bennett from the University of Notre Dame presented data at the symposium for the second microlensing detection of a planet (the first was a year ago). The newfound object weighs about a thousandth the mass of its star, which is comparable to the ratio between Jupiter and the Sun. Although both microlensing and transiting are relatively new to the planet-hunting game, they may be the best chance of detecting an Earth-sized planet outside our solar system. A future space mission using the transiting method, called Kepler, is specifically designed to ferret out Earth-sized planets, largely within one AU of their host stars. "We expect to see thousands of terrestrial planets, if they are common," said Bill Borucki, the principal investigator for Kepler. "Even if they are rare, we should see a few hundred." Kepler is currently scheduled for a June 2008 launch. Some of the most recent developments are calling into question what "normal" means for planets. One unexpected finding was an image of a red blip at a distance of about 55 AU from a failed star, called a brown dwarf. The planetary-mass object, 2M1207b, was first seen about a year ago, but it has taken several follow-up observations to verify that it was gravitationally bound to the brown dwarf. The projected distance between the two objects is 55 AU, but the actual orbit radius could be twice that depending on whether the planet-like object orbits in a circle or not. In comparison, Neptune orbits at about 30 AU. The brown dwarf and its companion have, respectively, 25 and 5 times the mass of Jupiter. The ratio of five to one is surprising: most of the planets found so far have a mass ratio of about 1000 to one. The new satellite is so weird, orbiting an object that's not a real star, that astronomers struggle over what to call it. "I am going to punt on whether this is a planet," said Glenn Schneider of the University of Arizona. Schneider presented images at the symposium from Hubble of both the dwarf and its companion. He believed that probably three quarters of his audience would call 2M1207b a planet. "It's exciting if this forms in the same way as other planets," Marcy said. "But it's also exciting if it formed in a new way." The large separation and small mass ratio probably rules out the core accretion process that many scientists believe is the primary way planets form. Instead, the strange object may have been born in a rapid collapse of material, they way small stars are thought to form. "This discovery probably says more about how low mass [stellar companions] are made than how typical planets form," said Douglas Lin of the University of California, Santa Cruz. The object is seen because it is young enough - around 8 million years old - to still be hot, about 1,700 degrees Fahrenheit. Schneider and others are specifically looking for hot planets around very young stars. He said that if you wait too long, these planets cool to the point that they are no longer visible. There are indications of water in the atmosphere of 2M1207b, and Schneider reported "tantalizing" evidence of variability in the brightness, which he speculated could be from clouds. One other new object presented at the symposium may give planet-forming theories a problem. Michel Mayor introduced a new Neptune-sized planet with very few heavy elements in its host star. "Theoreticians, get to your starting blocks," Mayor said as he revealed the detection. Most planets are found around stars with relatively high concentrations of elements heavier than helium. Although there is some debate about why this is, it is believed that lots of heavy elements are needed to form the dust particles that later stick together to form rocks and eventually coalesce into planet-sized objects. But Mayor's newfound planet appears to have arisen in a stellar environment "extremely deficient" in heavy elements, he said, and he called it "very embarrassing" for the current paradigm of planet-forming theories. One theoretician is not worried. "You should be careful about making a theory that explains everything," Lin said. Anomalies like these will keep astronomers busy. In sorting them out over the next few years, they hope to be able to say whether our life-supporting solar system is an anomaly too.